Draft: 2014, Oakland Athletics, 3rd rd. Brett Thomas Graves...in three seasons at Missouri, posted 9-16 record and 4.39 ERA (211.0/103)...graduated from Francis Howell High School in 2011...was state champion in senior season, earning First Team Louisville Slugger All-American honors, AllMetro Player of the Year honors and Missouri Gatorade Player of the Year honors after going 9-1 with a 1.95 ERA. In first Major League season, made 21 relief appearances with 1-1 record and 5.40 ERA (33.1 ip/20 er) for Marlins...Opened season on 60-day disabled list due to a left oblique strain suffered during Spring Training...Made two rehab starts with Single-A Jupiter, going 0-1 with 6.43 ERA (7.0/5), before making five rehab appearances (one start) with Double-A Jacksonville, going 1-1 with a 5.11 ERA (12.1/7) ..In four rehab outings as a reliever, was 1-0 with 2.16 ERA (8.1/2)...Returned from rehab and reinstated from 60-day DL on June 15...Made Major League debut on June 17 at Baltimore, retiring the only batter he faced...Earned first career win on July 28 vs. Washington with a scoreless 10th inning...Earned first career save on August 18 at Washington, with a scoreless 10th inning...In 12 games vs. National League East opponents, he went 1-0 with 3.79 ERA (19.0/8) and one save in one chance...Went 0-1 with 7.36 ERA (7.1/6) in four games in first half of the season; finished the season with 1-0, 4.85 (26.0/14) marks in 17 games in the second half. Made just 14 appearances between Single-A Stockton and Double-A Midland due to lower leg injury. Combined to go 1-1 with 4.47 ERA (56.1 ip/28 er)...Began season at Stockton with no record and 2.55 ERA (24.2/7) in seven appearances (four starts)...In four starts, allowed just two runs (none earned) over 15.1 innings with two walks and 16 strikeouts. In three relief appearances, allowed seven runs over 9.1 innings (6.75 ERA) with one walk and 13 strikeouts...Tossed 4.0 scoreless frames in first start, April 7 vs. Rancho Cucamonga. Didn't allow a hit or walk and struck out five...Made first relief appearance in next outing, April 11 vs. Modesto. Allowed one run and five hits while striking out four and walking none over 3.1 innings...In second start, April 15 at San Jose, tossed 4.0 scoreless innings, while allowing three hits and one walk with two strikeouts...Promoted to Midland on May 6 and made first career appearance at Double-A level on May 7 vs. Frisco. Went 5.0 innings and allowed one run on four hits with no walks and five strikeouts...Tossed season-high 5.2 innings in May 22 win vs. San Antonio. Held Missions scoreless on seven hits with a walk and three strikeouts...Struck out season-high six in next start, May 27 at Northwest Arkansas, with a season-high three walks...In only relief appearance with Rockhounds, surrendered 12 hits and nine runs (eight earned) over 5.0 innings vs. NW Arkansas on June 2...Placed on seven-day disabled list on June 14 with a lower leg injury and missed remainder of season. April 2, 2019 RHP Brett Graves assigned to Jacksonville Jumbo Shrimp from New Orleans Baby Cakes. 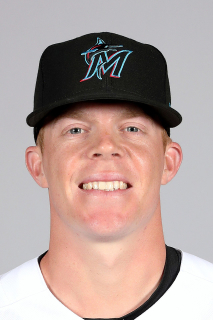 January 22, 2019 Miami Marlins invited non-roster RHP Brett Graves to spring training. December 10, 2018 Miami Marlins sent RHP Brett Graves outright to New Orleans Baby Cakes. June 15, 2018 Miami Marlins activated RHP Brett Graves from the 60-day disabled list. May 27, 2018 Miami Marlins sent RHP Brett Graves on a rehab assignment to Jacksonville Jumbo Shrimp. May 17, 2018 Miami Marlins sent RHP Brett Graves on a rehab assignment to Jupiter Hammerheads. March 29, 2018 Miami Marlins placed RHP Brett Graves on the 60-day disabled list. Left oblique strain. December 14, 2017 Miami Marlins claimed RHP Brett Graves off waivers from Midland RockHounds. September 26, 2017 Midland RockHounds activated RHP Brett Graves from the 7-day disabled list. June 19, 2017 Midland RockHounds placed RHP Brett Graves on the 7-day disabled list. May 6, 2017 RHP Brett Graves assigned to Midland RockHounds from Stockton Ports. February 26, 2017 RHP Brett Graves assigned to Oakland Athletics. April 4, 2016 RHP Brett Graves assigned to Stockton Ports from Beloit Snappers. April 6, 2015 RHP Brett Graves assigned to Beloit Snappers from Vermont Lake Monsters. July 16, 2014 RHP Brett Graves assigned to Vermont Lake Monsters from AZL Athletics. July 13, 2014 RHP Brett Graves assigned to AZL Athletics. June 30, 2014 Oakland Athletics signed RHP Brett Graves.